Want to make a difference? Help us welcome new international students! We are looking for passionate UFV students who want to help create a positive impact. 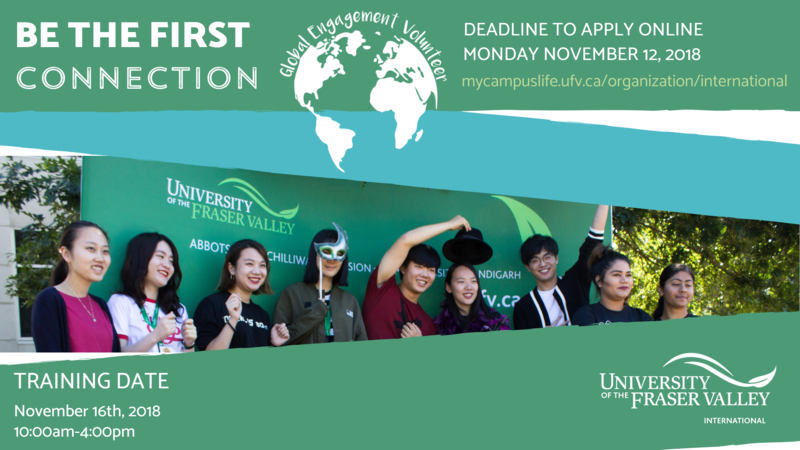 Global Engagement Volunteers (GEV) are an integral part of UFV’s community engagement and internationalization goals. The program helps both local and international students achieve lasting, positive academic outcomes and social relationships. Participants gain intercultural skills and engage fully in the culturally diverse and vibrant UFV community. Please note, this volunteer program is a minimum of 1-semester commitment. There are a series of levels to complete. With each completed level, you earn a certificate and Co-curricular credit! Successful participants will be directly invited to our private GEV pathway. Please note that the Global Engagement Volunteer (GEV) program is a pathway program on myCampusLife. All new volunteer applicants will begin at what we call GEV level 1. Click here to apply today! Level 1 GEV application deadlines are this coming Monday, November 12th, 2018. Mandatory training date is Friday, November 16th, 2018 from 10:00am-4:00pm.